In an aim to reduce pollution and dangerous particulate emission, car manufacturers are utilising more environmentally friendly fuels such as hybrids, biodiesels, hydrogen, ethanol, nitrogen and LPG Autogas. Hybrids are a blend of two fuel types, normally petrol and battery or diesel and battery. Available are plug-in hybrids, parallel hybrids and range extender hybrids. Plug-in hybrids (PHEV) are a halfway house between conventional hybrids and a fully electric vehicle. As the name suggests, you can either plug in the car to charge as well as being able to charge on the move. The PHEV can go longer distances on pure battery, up to 30 miles in some cases. A parallel hybrid is what most people think of when they initially think of hybrids. It can run its internal combustion engine (ICE), electric motor or a combination of both. Parallel hybrids are best for stop-start city driving as the electric engine runs up to 15 mph before the ICE kicks in later. Whenever you brake or decelerate the battery stores the power for the next time, you need it. Most parallel hybrids have a smaller battery and rely on the regenerative braking to power the car. As they use battery-less, most can only go 1.25 miles on a full battery. Range extender hybrids only have a ICE engine to recharge the electric motor. The ICE engine never actually drives, it just extends the range of the car. The battery can be driven by itself, but will require a charge to boost it up. Range extenders do tend to consume a lot of fuel and some owners have said they’ve filled up every 90 miles or so when doing a long trip. Bio-diesel is a more environmentally friendly fuel slowly becoming available across the UK. It is produced from renewable energy sources such as sugar beet, rapeseed and sunflowers or similar oil plants and is a biological substitute for regular diesel. Bio-diesel vehicles are more environmentally friendly than conventional cars which run on petrol and diesel because the fuel is not as toxic and does not produce as many damaging exhaust emissions. The difference between biodiesel and vegetable or waste oils is the fact that you can use certain percentages of diesel in cars without needing to massively modify the engine. Most normal diesel engines can cope with up to 20% biodiesel, although cars built before 1992 will need to be altered to stop decomposition of some parts. To be able to run any car on B100, 100% pure biodiesel, then the car must be altered considerably as the parts require different materials and build type. Hydrogen, when burned with oxygen is a zero-emission fuel, as it produces water which can be used to cool the engine. As hydrogen doesn’t occur naturally in large quantities in the earth’s atmosphere it has to be created, normally through electrolysis or steam-methane reforming. However it is very cheap to buy, £5/kg, making it more economical long term, but the lack of filling stations will make it trickier to fill. Hydrogen is also a more efficient fuel in a fuel cell than combustion engines, up to three times more efficient in some reports. Some diesels are able to run on a hydrogen/diesel mix, reducing emissions considerably. LPG or liquefied petroleum gas is a byproduct of crude oil refinement and so it is already produced in the creation of petrol and diesel, meaning that it is not harming the environment directly by producing it. It produces 11% less CO2 than a petrol car and twenty times less NOx than a diesel car. LPG also costs a lot less than petrol or diesel, sitting around 60 ppl, which is normally 50p a litre cheaper than petrol or diesel. LPG also makes engines quieter and so reduces more than one kind of pollution. 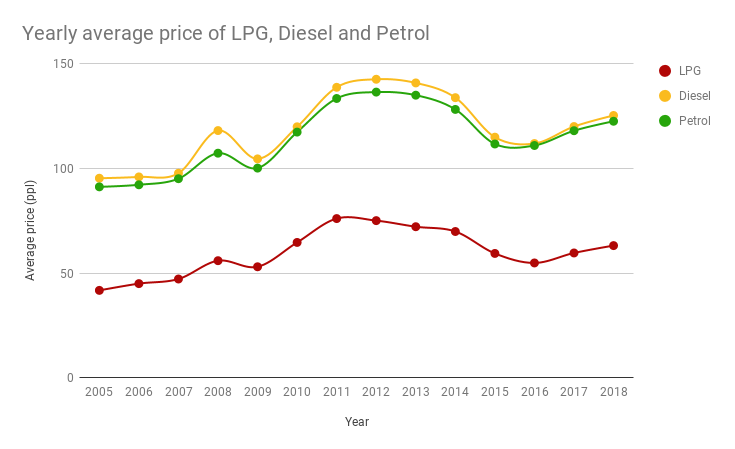 The chart below shows the difference in price between petrol, diesel and LPG since 2005, showing the economic benefit of LPG. Yes, it’s the same stuff that you have down the pub on a Friday night, although your beer won’t start your car if you need a quick top up. Ethanol is used to create so-called ‘Flexi-fuels’ ones that can be any percentage of ethanol and petrol. While the mileage for E85, 85% ethanol to 25% petrol, is a quarter lower than standard petrol, it runs as a higher octane number. This means that it might have higher fuel economy and therefore you it may only be around 20% less mileage rather than the 25 previously mentioned. Liquid nitrogen engines are available although not widespread. Nitrogen engines are run by storing the liquid nitrogen and then heating it up, extracting the hot air from ambient air and then pushing the pressurised gas created into a piston or a rotary motor.